Comprising some 2900 individual reefs and spanning some 2600 km from Papua New Guinea in the North to Australia's Lady Elliot Island in the south, the Great Barrier Reef is the world�s largest and most complex reef system. Built up over millions of years, by billions of tiny coral polyps (very small creatures which join together to form colonies), the reef has grown into world�s largest structure and is visible from outer space. Owing to its unsurpassed biodiversity, the reef is widely considered to be the best scuba diving destinations on the planet. In fact, the reef is home to over 400 species of coral, 500 species of seaweed and an incredible 1500 species of fish. Of course, large sea mammals, reptiles and sharks also make the reef their home. To date, marine biologists have identified some 30 species of whale, 6 species of turtle and 125 species of shark. 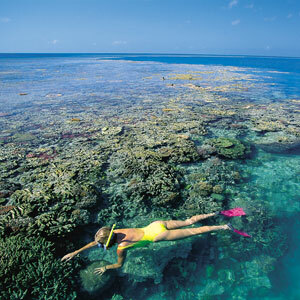 Many tourists begin their reef adventures from departure points in Port Douglas or Townsville. The large number of tour operators stationed there, makes getting out to the reef safe and easy. Mackay, Rockhampton, Cairns and other North Eastern coastal towns also make ideal entry points. The number of ways to explore the reef are nearly as vast as the sea creatures that inhabit it. You can snorkel, scuba dive, fly over by helicopter or small plane, peer out the bottom of a glass bottom boat or even experience the reef from the cabin of a semi submersible vessel. Those short on time can journey to the reef for the day, while those interested in a longer stay can schedule multi-day excursions and explore different parts of the reef, including small resort and wilderness islands. In all, more than 2 million people visit Australia's Great Barrier Reef each year. After experiencing its beauty and diverse marine life for yourself, you'll certainly understand why.